It’s been something of a love/hate relationship with the Arona these past few months. Easy to drive on the motorway, smartly styled and practical, my compact crossover has proved itself as a great all-rounder. It's affordable to run too, with economy averaging in the mid-40s. The Arona does have an annoying trait, however, with low-speed refinement leaving a lot to be desired. The issue starts as you pull away in first gear, with the high clutch and short-gearing resulting in a stuttering and bumpy get away. It doesn't matter what driving style you try, the Arona always bunny hops down the road. Things are wobbly in second too, with the Arona lurching at low-revs before finally finding its feet at 25mph and settling down to what I'd call a comfortable ride quality. At first I thought it was simply the clutch and engine running-in, but as I approach 2500 miles the Arona’s low-speed manners show few signs of improving. And it’s a real pity, because it’s a real peach to drive along on the motorway. Dan's SEAT Arona in Cambridge, yesterday. The cause of the hop, skip and jump experience is difficult to pinpoint, but if I had to make a guess I'd say it's caused by a combination of short-gearing and too much torque. It could well be that the gearbox's designed for the 95PS or 115PS 1.0 TSI petrol engines and not the 150PS 1.5 TSI - that would make sense given that the three-cylinder 1.0 TSI is the best-seller in the Arona range. However, if that is the case, perhaps SEAT should have made 1.5-litre version automatic only, because the six-speed gearbox is a poor match. Low-speed problems aside, the Arona is excelling in almost every other area. Fuel costs are falling as the engine runs-in; the 1.5 TSI Evo engine is nudging towards 46mpg and I'm optimistic that it'll start pushing close to the 50mpg barrier as it gets more miles under its belt. Road and engine noise is also low, although wind roar remains an issue. The Arona is supremely comfortable, however, with its FR sports seats providing excellent support for long trips. Indeed, last week, I took the car to Liverpool and was really surprised by how fresh I felt after the 200 mile run from Cambridge, with none of the usual aches or pains I usually get in my back from several hours behind the wheel. The ride quality is another area that has impressed. Given the large wheels, stiffened and lowered suspension, I expected the Arona FR to be car that would provide a hard ride quality over rough surfaces, but it remains supple and comfortable. After six months and almost 7000 miles, the time has come for Dan to sum up his Arona experience and wave goodbye to the SEAT. 3 July 2018: Why so serious? The cabin of the SEAT Arona feels somewhat flat when compared to the colourful interior of the Volkswagen T-Roc. When it comes to touchscreen infotainment, the Volkswagen Group pushes the competition away with a simple hand swipe, according to Dan. 5 June 2018: 1.0 TSI vs 1.5 TSI Evo - which is better in the Arona? Which petrol engine should you choose in your shiny new SEAT Arona? Dan mulls over the options. Safety recall effectively makes the SEAT Arona a four-seater, with a seat belt problem rendering the middle pew useless. 8 May 2018: Trim talk: Is it worth spending extra for an Arona FR? Dan's SEAT Arona FR Sport is turning heads but causing confusion with its lack of performance. Overactive start/stop system leaves Dan struggling as power steering and engine cuts out. 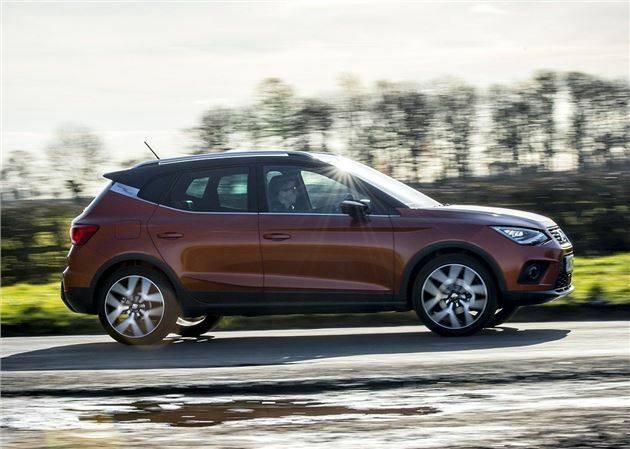 10 April 2018: SEAT Arona: An Ibiza in disguise? Dan’s experiencing a sense of déjà vu with the Arona. Could it have anything to do with the fact he's driven Ibiza? Dan is piling the mile on, but the Arona's low-speed manners are not improving. When it comes to storage, our Arona has the competition beaten when it comes to all-important bootspace. 27 February 2018: Windy city: Why is our Arona so noisy? Four weeks in and Dan has noticed that his long termer is a noisy long distance companion. Six months and several thousand miles await our new SUV with Dan behind the wheel. How will the Arona cope?